Welcome to the MythTickle shopping page! "I've been drunk in late-night Tokyo bars with Justin. And he saw me do things. Things he could tell people about. So let me just say this: MythTickle is the greatest comic strip I have ever seen." - Stephan Pastis, Creator, "Pearls Before Swine"
"MYTHTICKLE tickles me! Justin's world is full of fun characters and fantasticly witty situations!" - Mark Tatulli, Creator, "LIO" and "HEART OF THE CITY"
"Funny AND well-drawn. Justin's strip has transcended my preconceived notions about 'fantasy' comics. His delightful humor and deft linework have made me a fan of a strip in a genre I don't usually search out. I can't wait to enjoy it (all over again) in printed form!" - John Read,"Stay Tooned! Magazine"
Here it is, finally! 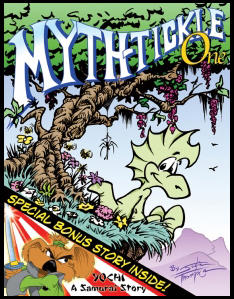 The very first MythTickle collection, showcasing the first six months (or so) of this acclaimed comic strip from GoComics.com. See the art and characters you love way back at their humble beginnings, and watch them evolve into to what you now find over at GoComics.com. Along with the comics, I've featured a story I wrote and illustrated a few years ago called 'Yochi: A Samurai Tale', a rhyming epic poem that takes place in old Japan. Don't trust the "internet demons"? If you are ordering outside the United States, the postage will be more. $6.50 for Mexico and Canada, and 8.50 for all other countries outside of the US. select your country from the drop down menu below and select 'Add To Cart'.